We welcome Scott Compton back to the show as we geek out over the classic rockumentary, This is Spinal Tap! In the spirit of rock and roll, this episode’s Play this, Not That features Mötley Crüe. There is also a new Remember That Song, and the ’80s Trivia is still up for grabs. Come give us a listen as we walk that fine line between stupid and clever. Also, feel free to email us your thoughts about Spinal Tap, or anything 80s. We would love to hear from you! We can be reached at returnto80s@gmail.com. Enough of my yakkin’. Whaddaya say? Let’s boogie! – We had somebody scheduled to sit in the 4th chair, but he is no longer with us. The official explanation is that he choked on vomit. We just don’t know whose. What brokerage firm’s name, when mentioned in TV ads, silenced entire rooms of people? – Did people think this was real? We are back for another week of Deep Tracks, courtesy of Robert! This week, we are continuing with Night Ranger. I am so happy that Robert is tackling a song from Man in Motion today. In 1989, I joined the Navy, went to Boot Camp, and had school. After about a month of leave (vacation), I was stationed at my first base – Oakland Naval Hospital. I didn’t have much music with me at the time, so I promptly joined Columbia House, and got 10 CDs for a penny. One of these CDs was Man in Motion. The only song I already knew about was “Restless Kind“. I loved every song on the CD right away, and it became one of my favorite albums. Now, here is Robert to bring us “Halfway to the Sun”. I am really hoping you enjoyed the five songs by Night Ranger that I gave you last week. One thing I have noticed about Night Ranger fans is that they are loyal and they fully understand just how many great song the band has recorded. They also recognize that the band is a bit underrated (as Paul noted last week). So saying, I remain with the view that just five song by Night Ranger is not nearly enough. This week I give you part two of Night Ranger’s deep tracks – five more songs that I am convinced will make you a fan of this excellent band’s music. Last week I was not able to get in any songs from the Man in Motion album, so this week I am going to start with two; first up is my favorite rocker from this album. When I discuss songs I really like I have a tendency to fall into hyperbole, so forgive me here. This just may be the perfect rock song: strong rhythm guitar and bass, a catchy as hell chorus, and a dynamite solo played by both Brad Gillis and Jeff Watson. I can still remember the first time I listened to this song. Man in Motion was the second CD I purchased (Survivor’s Too Hot to Sleep was first). While I still had my vinyl and cassettes, I was in love with my new CD player, so I exhausted these first two purchases. When I heard “Halfway to the Sun” (track #6), I had to push the back button four times and listen to it again, and again, and . . . I think you get the point. This may even by one of my favorite songs by Night Ranger (period, exclamation point). Musically, it is just too good to deny or turn off. Lyrically, it is solid enough. I love the opening verse, “Well, I’ve been out there thinking about the night before/ How you held me tight / You kissed me like you’ve never done before / Well, I ain’t no politician / But I sure know what was said / I don’t put much weight on promises / That you made to me while you’re laying in my bed.” All of that leads into that catchy chorus that informs us (and her) that she needs to be careful who she is hanging out with because, “When you step out on your conscience / You step out on the run / You won’t step on me ‘cause I’ll be gone / I’ll be halfway to the sun.” This is an absolutely great song that I would put in my all-time top ten deep tracks. This song is my favorite track from Big Life and the first video I watched on Canada’s MTV equivalent Much Music TV. I was visiting a relative in Arkansas who had a satellite television hook up, so I watched a few hours of music videos on this station. This song has that typical Night Ranger beginning: a rising keyboard that leads into a great rhythm guitar. Ironically, original keyboardist Alan Fitzgerald would leave the band after the Big Life album because he felt the band was writing too much guitar driven music. This song has great energy that is infectious and video that is linked here really captures that energetic joy. Of the five songs featured this week, “Color of Your Smile” has my favorite solo. This one features both Gillis and Watson who play sort of dueling solo roles. I am one who really likes well thought out and well written lyrics, but occasionally simple ones work best. Here we just have a man who likes to hang out with a woman. He is intrigued by her looks, but knows that it may not last long, “And I’m aware / Of all the friends you’ve gone through / A situation that convinces me / I’m cool on price / But short on my nights with you.” It just doesn’t matter – for a while anyway, “Never had a tougher situation / Lot of trouble with your reputation / I think, I’ll go and take a well deserved holiday.” Great energy – great song – great week of Night Ranger. I honestly believe that you fans of ‘80s rock liked what you have heard here this week. I admire Night Ranger for continuing to make high quality music throughout the two decades that have followed their ‘80s heyday. They have released six more albums between 1995 and 2014. I have them all and can honestly say that they have not compromised their musical style one bit. They are still true to their California rock roots – as can be heard in this, their most recent video, the titular song from the from the album High Road released in 2014. Yes, they are older and the band members have changed a bit, but that core of Jack Blades, Brad Gillis, and Kelly Keagy are still together and still making great music. I am finding it impossible to let the band go with only five deep tracks, so next week I am going to share five more. I may also reveal the third tape I bought that day. I do say MAY because it is a bit embarrassing. If the title reminds you of the sometimes forgotten 1987 film starring Michael J. Fox, it should because it was also a part of the soundtrack as well as being on the Big Life album. The song’s verses do fit the film pretty well. If you remember, Fox played a young man who had just graduated from the University of Kansas and was given a job in his uncle’s company in New York City. The second verse captures the desires of Fox’s ambitious character, “I always said I could make it and be who I am / There’s a new look in sight, what a change for the new modern man / With all this it seems like I’m dying for more / The streets are on fire, never seen it before.” While it does fit the film perfectly, it is also true of the band as well. Achieving any sort of success in the music world is not easy. There are plenty of musicians and singers who have plenty of talent, but no one has heard of them. Any sort of success in this field requires a bit of luck and a ton of hard work. The music is what you have come to expect from Night Ranger: strong guitar work, a steady bass, clean vocals (by Blades and Keagy) and a good solo that is quick and a bit understated in this song. Fitzgerald’s keyboards in this song, though, are memorable, coming with a steady rhythm as well as in quick bursts throughout the song. I love the final lyric in this song, “With nothing to show, just sweat from my soul / My heart’s on the line and I’m dying to go / Look at us now / gonna make it somehow / Hold on to me, baby, can’t hold me down.” – a somewhat inspirational ending to an excellent deep track. I have always been in love with the first forty seconds of this song. The bass and rhythm guitar are not complicated, but the sound they create is irresistible. All of the band members are at play here, but this rhythm that these two create really make the song. Once again, the solo is fantastic. The lyrics of this song are a bit suggestive but also capture the many things that women do for the men they love (and men need it). The physical needs are clear (and may be a bit overdone), but there are also emotional needs that are necessary, “I need a woman to find a window in my soul / Bring me in from the cold that’s where I’m dying.” If one does not get too hung up on the obvious sexual innuendos, this song can be seen as a declaration of what some men do not want to readily admit: it is very difficult to live without the comforting support of a good woman. And if you like the innuendo – there is that, too. This song captures the same insidious idea of the destructive nature of rumours that can be found in The Great Gatsby by F. Scott Fitzgerald, “Take It On the Run” by REO Speedwagon, and the obvious “Rumours” by the Time Social Club. This song begins with nice keyboards by Fitzgerald that build to a steady beat and a second keyboard melody that sustains the beginning of the song. Naturally, then, a strong rhythm guitar kicks in – but those keyboards never really leave. The solo in this song is played by Gillis and is balanced nicely with the strong keyboards. As one would expect, the rumours in the song are in reference to a couple who seem to be on the outs. The speaker has heard a rumor that, “. . . you have a new friend and lover / Who keeps you warm on the cool, cool nights.” Naturally, he does not want to believe that this is true. Instead, he choose to discuss the evil nature of rumours and how destructive they can be. Ultimately he is forced to admit that the rumours are true, “You used to call me by my first name / Now you never even call me at all / Now you say that I’m the one to blame / Doesn’t matter how I feel at all.” So it’s true. Just like in those other songs and stories, rumours are not a good thing and can put a quick end to things that could be a life long positive. Hi Everybody! It is a new week, and time for a new set of Deep Tracks, brought to us by Robert! I am thrilled with this week’s featured artist – Night Ranger. Night Ranger was one of my favorite bands of the ’80s, ever since I first heard “Sister Christian”. They are a very underrated rock band, and have a lot of great songs that have gotten very little, if any, airplay. If you are not all that familiar with Night Ranger’s catalog of music, then you are in for a treat. Let me take you back all the way to last week. I told you of my situation: leaving Germany to return to the U.S. for college, one walkman – zero tapes. In my rush I bought Andy Taylor’s Thunder – you know about that one. One of the other tapes was Night Ranger’s Big Life. I knew “Sister Christian” and “When You Close Your Eyes”, but I had never heard an album by this band. I am very glad this was one of my pressurized purchases because Night Ranger has become one of my favorite bands. Full disclosure: I have a five-way tie for favorite band – REO Speedwagon, Bon Jovi, Journey, Survivor, and Night Ranger – I do not even try to break the tie any more. The tape I bought, Big Life, was released in 1987, and Night Ranger released a total of five albums in the ‘80s: Dawn Patrol (1982), Midnight Madness (1983), Seven Wishes (1985), and Man in Motion (1988). The first four of these albums all reached the top 40 in album sales with two of them (Midnight Madness and Seven Wishes) achieving platinum status. During this time they had six Top 40 singles with two, “Sister Christian” and “Sentimental Street” reaching the top 10. The original line up that started the first decade of this band was: Jack Blades on bass and vocals, Brad Gillis and Jeff Watson on guitars, Alan Fitzgerald on keyboards, and Kelly Keagy on drums and vocals. Night Ranger is clearly not the most famous or best selling band to come out of the ‘80s, but they did achieve some solid success. While almost every fan of ‘80s music knows the big hits, but many of their great songs, which have survived in their live shows and with their fans, have remained sidelined in relative obscurity to the majority of those general fans. 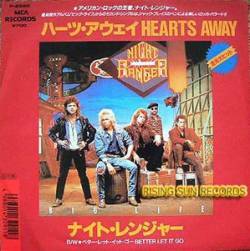 So, once again, I give you five songs from a great band that you may have missed – here are some deep tracks from the California based Night Ranger. This song was a minor hit in 1982, reaching #54; despite this, I am going to use it as the first deep track. This song begins with a strong rhythm guitar that will become a staple of Night Ranger songs. The two guitarists, Brad Gillis and Jeff Watson are equally solid and play prominent roles in nearly all of the band’s songs. They trade solos among the band’s songs and occasionally both have one in the same song; Watson has the solo in this one. Musically there is a perfect blend of two rhythm guitars, keyboard, and bass. Lyrically, the song captures that old feeling of thinking about that girl we all “once knew as a schoolboy.” Those memories are always idealistic, making that girl feel like a perfect fit. That face from the past is perfect, but he is not with her now, “But I am a long ways away / And I want to be with you today / I’ll think of a way I can get back.” Does this mean that he is unhappy now? I’m not sure, but he is doing what many of us do – remembering the past and trying to think of ways to get it back. Honestly, isn’t that what most of us are doing? I know that I am every time I write for Return to the ‘80s. “Sing Me Away” is a steady rock song that is a great representation of the type of music Night Ranger will produce for the rest of the decade.